Download this episode by right clicking. Dr. Lamar’s Spinal Cartoon on Chiropractic Radio at SpinalToons.com. “THIS JUST IN!”: Listen to rare, vintage 1931 BJ Palmer Chiropractic Radio Broadcasts in our exclusive 5-part series! Does your podcast listening schedule need a little backbone? If so, it’s time to schedule an appointment with your podcast chiropractor, Dr. Thomas Lamar. Spinal Column Radio, episode number six. 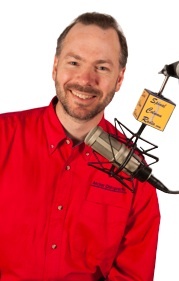 Coming up on Spinal Column Radio: From Broadcasting to Podcasting — chiropractic is on the air! (part 2). And welcome back to another exciting and information packed episode of Spinal Column Radio. My name is Dr. Thomas Lamar, chiropractor and Dad of 6. And this is the podcast that gets you to think. To think about your health in a whole new way. We’re the podcast for your backbone… the podcast with backbone. Who knew that spinal education could be this much fun? 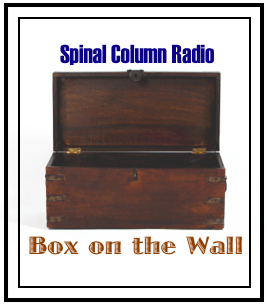 We’d like to invite you to visit our podcast website at spinalcolumnradio.com where you can learn more about us, podcasting in general, and can access the show notes for this episode. And of course you can also leave comments and ask questions. We also have “socializing” links now to allow to easily share our podcast with friends and family through facebook, twitter, email… and a bunch of others. One of the most attractive aspects of podcasting is that you can listen to what you want, where you want, and how you want. In other words, you don’t have to huddle around the computer at a specific time of day and week to hear your favorite show. Nor do you have to confine yourself to listening at your computer. Podcasting allows you to automatically receive the content that you enjoy listening to through the subscription process; download it to your iPod, or other portable digital media player, and then take it with you — wherever– listening when ever you choose — and, of course, how often you choose…. I mean, if you really like it… listen to it more than once. A radio broadcast — by comparison — just can’t offer the same convenience. 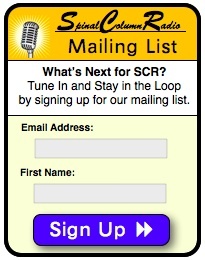 Furthermore — and really this is the point I want to make here — getting highly specific and “niche-type” programming — such as what we offer here on SpinalColumnRadio — is not common on broadcast radio. And if it is available, it’s usually offered in a less than desirable time slot… say 4am on a Saturday. Forget about chiropractic educational programming during Prime Time…. unless, however… you are a chiropractor that happens to own and operate your own radio station. And that, of course, was the case for Dr. BJ Palmer and his historic radio station WOC in Davenport, Iowa along with sister station WHO in Des Moines. And that is what we started talking about last episode in Part 1 of “From Broadcasting to Podcasting — chiropractic is on the air!” Today, we’ll wrap it up with Part 2. In the first year of operation, the WOC logged 43,000 visitors. Imagine… if you were one of those visitors, though. Just what would have seen? Well, first of all you would have seen tall, steel towers, jutting skyward on the roof-tops of many of the buildings that comprised the Palmer School of Chiropractic — which was situated on its own block on Brady Street in Davenport. From these towers radio antennae were slung. The music studio and radio rooms… they were located on the 4th floor of the school’s administration building at the east end of the “Up-E-Nuf roof garden.” The studio contained lots of heavy drapery and carpeting to help with sound proofing and it had whicker furnishings — which was very popular back in that day… But probably not the “quietest” furniture to sit in. Their first microphone, according to Palmer, was an “ordinary telephone receiver, set in the middle of an ordinary chopping bowl.” Interestingly, these studios would soon double for the operation of the first school-based public address system on the Palmer campus. The BJ Palmer Mansion, which was located at the end of the block on which the school sat, contained a Chickering Piano and an Aoelian Pipe Organ in the home’s music room which acted as a “second studio” that WOC would use for their church music broadcasts. WOC acted as a communication hub and handled up to 12,000 pieces of mail a week. 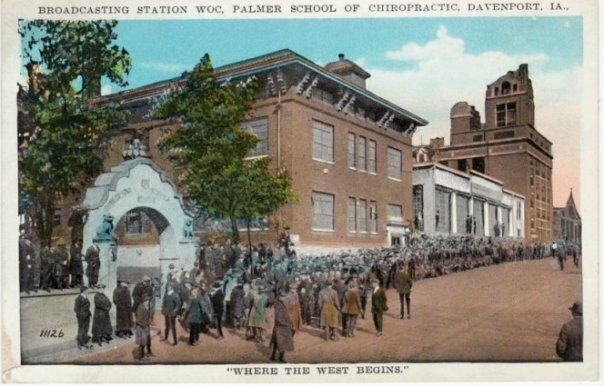 Another interesting thing about Palmer’s Chiropractic Radio Station was that they were one of the first to install a Western Union telegraph terminal to help facilitate rapid world-wide communications — by February 1924, they reported handling up to 3000 telegrams and 12,000 pieces of mail per week. And then of course the WOC had its share of notable employees. And then of course there was locally renowned organist Irwin Schwindel was WOC’s first music director and helped develop the Palmer School of Chiropractic Orchestra — I wonder if they were named the “Spinal Chords.” Forgive me, sometimes the punster in me comes out. By the way, on that note, while I was in Chiropractic College, I paid homage to Chiropractic Radio in my regular spinal cartoon that ran in the school paper. You can check that out on my SpinalToons.com website. I’ll put the link the show notes. 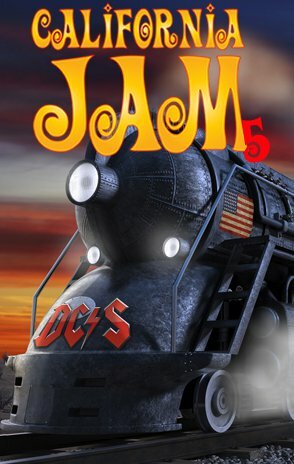 Also, a very popular children’s program came out… from the WOC, which aired week nights at 6:30 (except, of course, on Tuesday, as that was the evening that the WOC was “silent” in Davenport) — the children’s program was known as the “Sandman’s Visit” and it was hosted by Val McLaughlin. But, by far the most interesting hiring attached to Palmer’s radio station — revolved around a young, ambitious gentleman who was given a job as a sports announcer when no other station would. As the story goes, he recalls taking the elevator up to the top floor where he was met by a ruddy-faced Scottish man named Pete MacArthur — the WOC program manager. Well, the young man explained that he wanted to get into radio and was willing to take any job available. Apparently they had just filled an openning for an announcer and had taken auditions the day before. The young man explained that he wanted a job in radio because his goal was to become a sports announcer. “Do you know anything about football?” the station manager queried. Before he knew it, the young man was sitting down in front of a microphone. That man, after making his mark in radio history, would go on to eventually become our 40th President of the United States. That’s right, Ronald W. Reagan. Yes, it’s true. 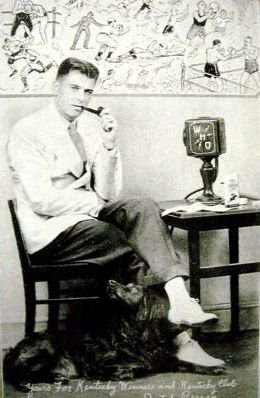 Ronald Reagan, or “Dutch” Reagan, as they called him, was a sports announcer for the WOC and then later, sister station, WHO. Interestingly, back in those days, (if you didn’t pick up on this) they didn’t call the games live like we are used to. They’d recreate them based on information they got off the wire reports received on the tele-type. So, it was “factual fiction” and required not only a thorough knowledge of the game but also decent story-telling skills. 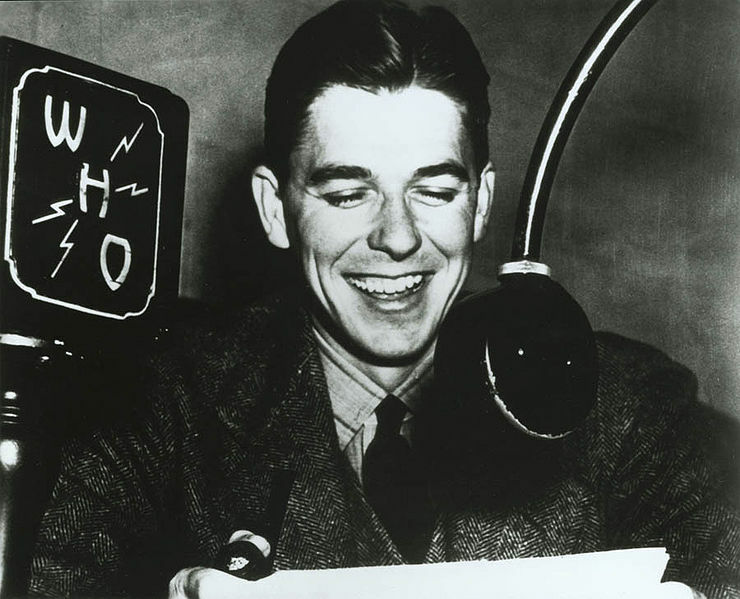 Speaking of which, you can read all of President Reagan’s interesting Radio story at RonaldReagan.com… I’ll put the link in the show notes. Well, before I wrap things up, I have a couple of couple of interesting little-known tidbits about the WOC. During the Dark Days of the Great Depression, the Palmer School of Chiropractic flirted — as did many businesses — with bankruptcy. But it was the WOC, along with some other “mercantile endeavors” devised by BJ’s son, David, that helped return the school back to stable financial ground. 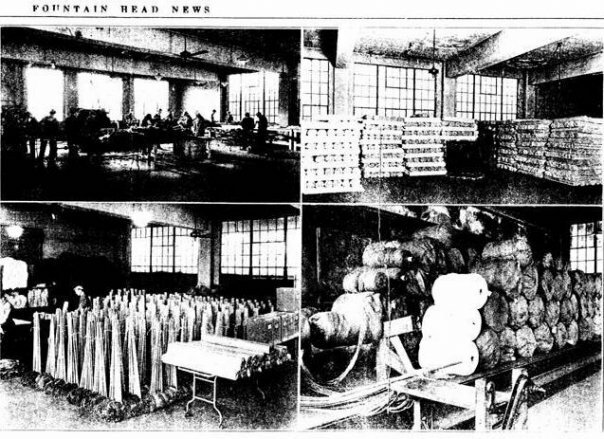 David Palmer Enterprises’ Mop Factory helped keep the Palmer School of Chiropractic afloat during the dark days of the Great Depression. Examples of this were — and I just find this fascinating — employees of the school were paid with WOC stock and the chiropractic students sold mops door to door that were manufactured by David Palmer Enterprises. 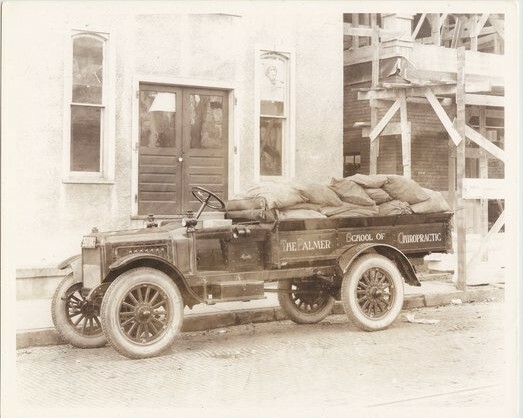 In addition, the second floor of the DD Palmer — and DD Palmer, by the way, was the founder of chiropractic and was the father of BJ…. so, the second floor of the DD Palmer Auditorium was converted into a skating rink. Now that’s a piece of chiropractic trivia you don’t hear about everyday! 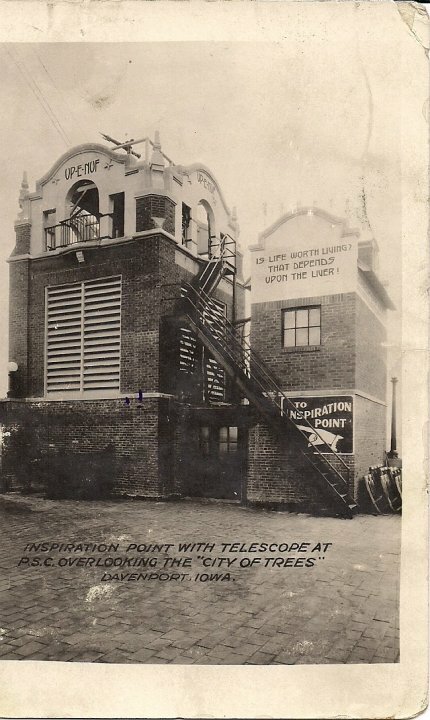 WOC’s first broadcast was February 18, 1922. And while no longer owned and operated by Palmer College of Chiropractic , the WOC and WHO stll are in existence today, in 2010. And as far as I know, they no longer have any chiropractic programming — but that, of course, is freely available on SpinalColumnRadio.com. Well, while we chiropractors certainly revere B.J. Palmer as a pillar of the chiropractic profession, he certainly left his mark in the history of radio and then later in television — where he’d go on to add “owning and operating television stations” to his resume. And if all that weren’t enough, in 1942 he authored a widely read text in the radio industry entitled Radio Salesmenship. The text was seen as a staple in broadcasting schools back then and went through several editions. Actually, I was fortunate enough to find one of these rare gems (a 1947 edition) for sale on the Internet. It’s pretty interesting to read and looks great on my bookshelf. He sure was a stickler for brevity of words and using positive copy. Actually, his teachings in this book helped me to come in under my 650 word limit for the article that I wrote on this subject. This podcast is a different story. 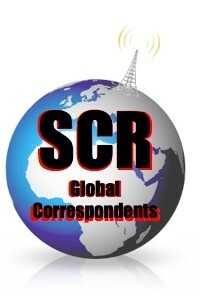 So, if you’d like to read a summarized version of this podcast, check out my article on SpinalColumnBlog.com. And, of course, you’ll find the link in the show notes. With Palmer blazing the “chiropractic radio trail” at the forefront of the 1920’s “Radio Boom,” chiropractors in radio markets across the nation have continued to broadcast the “wonders of chiropractic” to the great “unseen audience.” Now, some 88 years later, in the midst of what is in essence an Internet “podcasting boom,” chiropractic has another opportunity to present its story in an exciting new medium. In the year 2004 less than one million people were listening to podcasts, and now in the year 2010, it’s estimated, in the United States alone, 47 million people will listen to podcasts, with 17.5 million of those listening to at least one podcast a week — and these numbers are projected to go even higher (up to 65 million by 2012 with 25 million listening to at least one per week). Folks this is not a fad. Get comfortable with it, because it appears that podcasting has plans to stay for a while. You know, something tells me, if Palmer were alive today, he’d be saying the same thing about the podcast, and he’d be podcasting right along with me. Well that’s going to wrap up our two-part series of From Broadcasting to Podcasting — chiropractic is on the air. 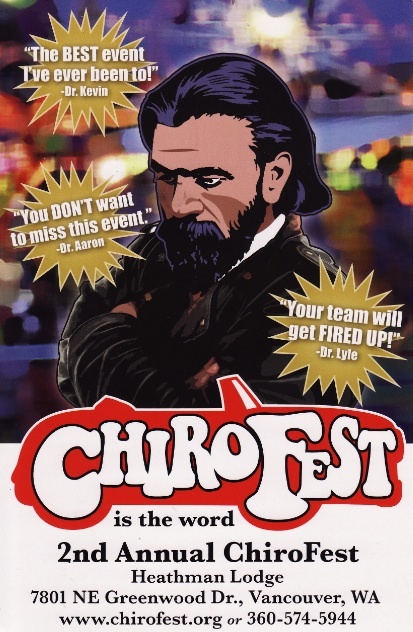 You know, that’s a piece of chiropractic history I just never get tired of. 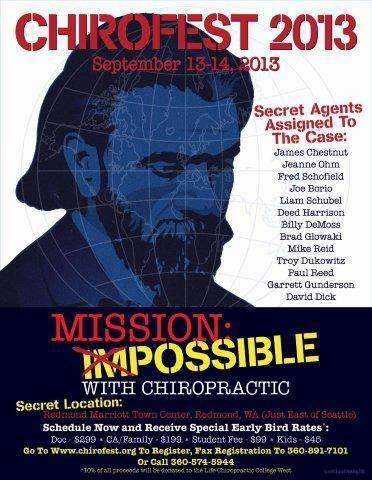 Hey, special thanks to all of the chiropractic and radio historians out there who have helped keep this story alive. Spinal Column Radio would like to remind you that true health comes from the inside out — not outside in. As such, the content of this podcast, along with the show notes and related links, are not intended to cure, diagnose, treat, or prevent any disease. But, instead, is meant to inform and inspire you in asking better questions regarding your health. Since the circumstances surrounding your particular situation are unique, you are encouraged to consult with a Doctor of Chiropractic — or other health care practitioner of your choosing. Hey, next time on Spinal Column Radio, we’ll talk about a neck condition that has a funny name… And while you may never experience it yourself, chances are someone in your life will. Be sure to “listen in” to find out more. So until then, for my son Logan tweaking the knobs on the mixer board…. This is Dr. Thomas Lamar, your podcast chiropractor. Spinal Column Radio is a production of Spinal Column Communications in conjunction with AnchorChiropractic.net. Copyright 2010. Did you know that Mr. Russell Swank owns his own radio station? Located next door to the fabled Swank mansion, the “Ham Shack” is available for tours if you call in advance. Hey, I’m on a webinar with Cliff Ravenscraft and you right now! My dad is a Chriopractor and I’m trying to get him to do a podcast to so we’ll be checking out your podcast as soon as the webinar is over! Oh, and to show you that I learned something at the webinar today… not only am I emailing you my response, but I’m also posting it in the comments section for all to read. 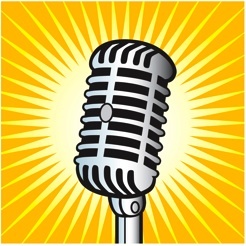 And to plug Cliff… for anyone curious about the “webinar” we are talking about and is interested in starting their own podcast, check out http://PodcastAnswerman.com.